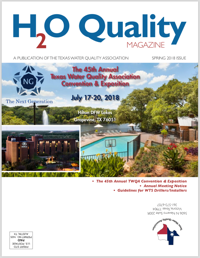 The Texas Water Quality Association publishes a quarterly periodical, the H2O Quality Magazine, designed to keep our members up-to-date on local, state and national developments affecting the water quality industry. We welcome contributions, both from our members and the general public, in the form of technical and business articles. If you have an article you would like to submit for consideration in our next publication, please submit your article to the TWQA Publications Chair or Executive Director. TWQA also offers quarter-, half- and full-page advertising in our periodicals. If you have products or services you would like to promote to our members or their customers, please submit your ad copy to TWQA Publications Chair or Executive Director.